Happy Feast of the Transfiguration, everyone! Since it’s Sunday, here is the Gospel of the day! The Transfiguration was a BIG event for the disciples of Jesus. Before the Transfiguration, they followed Him and watched Him preach and do all of these awesome miracles. And miracles are awesome things! But, many prophets before Jesus have done those miracles too. So, although Peter intellectually knew that Jesus was the Messiah (as he says in Matthew 16 somewhere! ), it was still not something that he fully understood. And, can you imagine it? Before the Transfiguration, Peter has seen so much. Already, he professes, when prompted, that Jesus is clearly the Messiah. But, the Transfiguration, this mystical encounter that he has with Jesus, changes everything. And that is one reason why I love this painting. The Transfiguration, by Maestro de Santa Teresa, c. 18th century. Monasterio de Santa Teresa, Ayacucho, Perú. 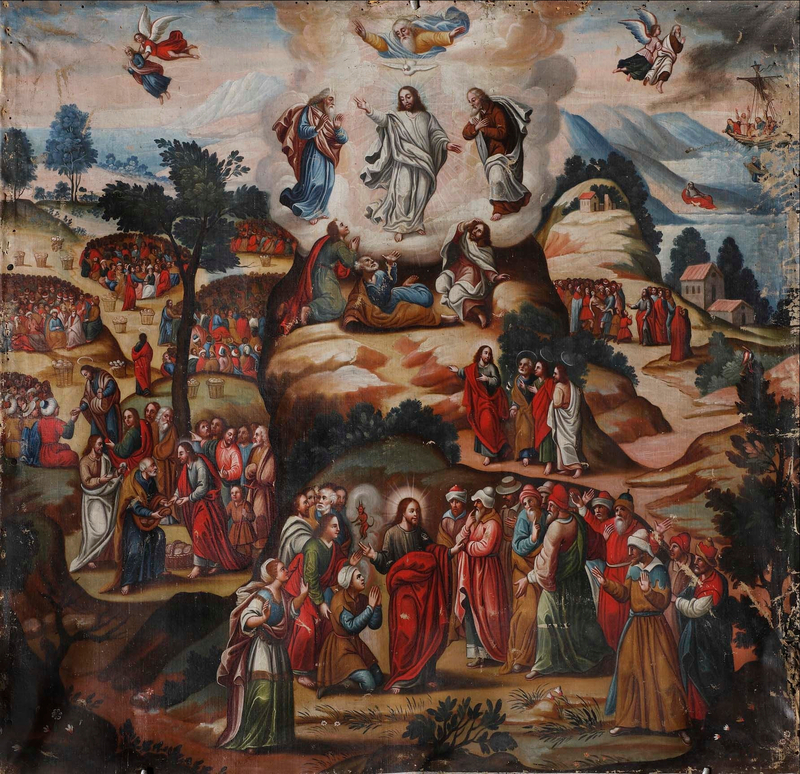 In this example of colonial art, which might have come from the famed Cuzco School, famous for making beautiful, religious art with a distinct Peruvian flair, the ministry of Jesus is laid out in a variety of images. Jesus preaches, feeds the masses, heals, and even calms the storm. But, at the very center of the picture, Jesus suggests going up to mountain. And then, at the height of the picture in the forefront, the Transfiguration occurs and the three disciples are literally floored by seeing Jesus transformed into God in this mystical experience. Yes, Jesus showed that He was the Messiah in many places. And yes, Peter believed this profoundly. After all, when Jesus called Him, he left his entire old life behind and followed Jesus as His disciple! But, this was the point where Peter experienced the entire power of God and was left, babbling incoherently about tents, till Jesus snapped him out of it. 16We did not follow cleverly devised myths when we made known to you the power and coming of our Lord Jesus Christ, but we had been eyewitnesses of his majesty. 17For he received honor and glory from God the Father when that unique declaration came to him from the majestic glory, “This is my Son, my beloved, with whom I am well pleased.” 18We ourselves heard this voice come from heaven while we were with him on the holy mountain. 19 Moreover, we possess the prophetic message that is altogether reliable. You will do well to be attentive to it, as to a lamp shining in a dark place, until day dawns and the morning star rises in your hearts. Nor is the Transfiguration an event that we celebrate solely in the past! Often in our own lives, we too can believe in Christ and follow Him faithfully and do everything that we can to be with Christ. Yet, some of us can sometimes experience profound, mystical experiences from the Lord in the form of personal revelations — revelations which are absolutely in accordance with the Gospel and Church teaching, but are personal in the nature that they touch us and reveal to us God’s glory. And honestly, those sorts of revelations can knock us a bit silly too! Many saints have reported such mystical encounters with Christ and, who knows? Maybe you have as well! If so, that might have been your own little mini-Transfiguration. In any case, have a Blessed Feast! Through the Transfiguration, the Lord has revealed Himself to us in His Glory! Alleluia! Thank You for revealing Yourself through the Transformation in Your glory. And thank You for being present in our lives and humbling Yourself as a man so that we can approach You more easily. Help us recognize You as Lord in all of Your Glory so that we may follow You more faithfully. If You choose to grant us mystical experiences, help us love You better.